Of the many GE employees traveling to Rio for the 2016 Olympic Games this month, few are as anxious and as hopeful as Chris Holmes. Sure, Holmes’ co-workers will be under plenty of pressure. GE machines produce one-third of Brazil’s electricity. The company is also supplying medical and power generation technology and even LED lighting to the Rio 2016 Organizing Committee. The world will be watching. But Holmes will be in Rio to cheer on his oldest daughter, who is making her Olympic Games debut in Rio as a fencer. What is it like to watch some of the world’s finest athletes try to jab your daughter with an épée, the largest and heaviest sword used in fencing? Wonderful, Holmes insists. Holmes, who works as a business development manager with GE Grid Solutions, discovered that the local parks department had a fencing program run by renowned master swordsman Raymond Finkleman. So Holmes and his wife drove to Finkleman’s Chevy Chase Fencing Club for a look. They found a bare-bones room with heavy rubber mats instead of regulation fencing strips. It wasn’t romantic, but it was a great training ground, and after just a few lessons it was clear to Holmes and his wife that their daughter had talent. She began spending most of her weekends and after-school hours in Finkleman’s unadorned gym. Within six months, she was invited to compete in a tournament in Boston. Keen to keep their expectations in check, Holmes and his wife figured their little girl would do a few bouts and get tossed out. Instead, she finished third. “The hook was set,” Holmes recalls. 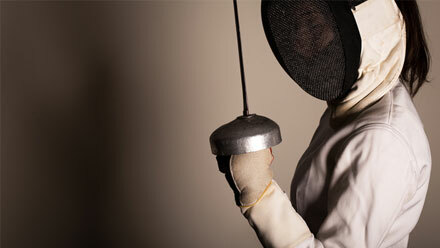 “She really enjoyed it.” At 12, she was the top fencer in her age group in the country. At 14, she began competing internationally, winning silver at her first world championships. The market for world-class sword-fighting skills isn’t what it used to be, so the Holmes family never let fencing undermine studies. When the annual fencing tournament schedule came out in August, Holmes recalls: “We’d go in and sit down with the dean and say, ‘Here’s when we’re going to be gone.’” But she took most of her academic tests early. Though the fencer missed 30 days of school her senior year, she graduated with honors and is now completing a university degree in neuroscience. The task of supplying power to Rio 2016 is as intense as the competition itself. Holmes knows this as well as anybody. He used to do business in Brazil as a representative for a sales team that covered the Americas. These days, his job is managing GE’s relationships with six large electric utility clients who use the company’s power distribution software in the Northeast. “I quarterback all the experts in helping utilities understand what [GE Grid Solutions] software can and can’t do,” he says. The region where Rio is located gets its power from the Itaipu Dam, a hydroelectric facility on the Paraná River that includes 20 enormous power turbines built by Alstom. (When GE acquired Alstom in late 2015, it brought over employees such as Holmes, who had worked at Alstom for three years.) The Olympic Games will put a strain on that resource. The event facilities—including the International Broadcast Center, stadiums, and other buildings that serve the athletes and their entourages—will require an additional 250 megawatts of energy. GE’s energy management software can analyze the performance of an electrical grid and balance the voltage in real time, which allows users to push less energy through the grid, saving power and making their operations more energy-efficient. Holmes likens it to the way the human body responds to a clogged vein or artery: “It will reroute the system to isolate the outage in as small an area as possible.” In most cases, he says, the software is automated and responds instantaneously to rebalance the power load. Though Holmes’ top priority will be cheering his Olympian, he plans to drop by the GE lounge where the company is hosting its customers. He’ll also travel around Brazil during his stay. But you can bet he’ll return in time to see his daughter walk in the Closing Ceremony of the Rio 2016 Olympic Games.